Part of the fuel injection system a fuel injector is reasonable for allowing fuel to enter the engine which is controlled by the car's computer. Various sensors provide feedback information to the computer which adjusts the pulse width of the injector pintle valve that provides a spray pattern to help atomize fuel in the combustion chamber. 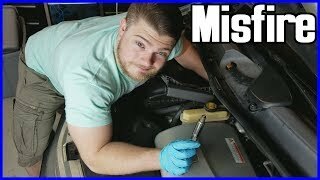 Fuel injectors can fail in one of three ways. Being made of plastic and metal natural expansion of dissimilar materials can make the injector leak externally which can be detected while driving due to a fuel odor. The pintle valve of the injector is subject to volumes of fuel which can add varnishes to build on the exit point of the valve causing the spray pattern to diminish or stop altogether. Electronic windings are used to magnetically open the injector valve when signaled by the computer. Separated by a thin insulator these windings can touch together causing the injector to short circuit causing it not work, or force the injector to stay open flooding the engine or cylinder. Fuel injector replacement costs can vary depending on the location and configuration of the fuel injection system ie: direct, throttle body or port injection. Generally fuel injectors cost between $45.00 and $90.00 (US) each, labor will vary. Its best to allow the car sit for a couple of hours without turning the ignition key on. This will help depressurize the fuel system and minimize fuel leakage when working on the fuel injection system. It's a good idea to wear protective eyewear and gloves when working with fuel. Start by located the fuel injector that will be replaced and disconnect the electrical connector by releasing the safety clip and gently pulling upward. These connectors have a weather pack seal designed to keep moisture out which can get a little stuck. In this case work the connector back a forth to loosen the seal. On direct injection systems fuel pressure in the rail can be as high as 1200 PSI. Use a line wench to slowly loosen the injector line to relieve fuel pressure, have a shop towel ready to cover the fuel release, not more than a teaspoon with be present. Remove the fuel rail mounting bolts and lift upward to separate the rail from the injector. Some systems feature injector retainer clips which hold the fuel injector into the fuel rail. In this case the fuel injector will be removed with the rail. Using a small standard screwdriver or pick remove the retainer clip from the fuel injector and work the injector from the rail. Keep a shop towel handy to catch excess fuel while removing the injector. Inspect the old fuel injector making sure the sealing O rings are accounted for. Match the new injector to the old unit, some injector replacements can look a little different which is normal. Use clean engine oil to lube the O ring seals preventing seal damage during reassembly. Push the new injector into the fuel rail and reinsert the trainer clip and tighten down the fuel rail. After the job is complete start the engine while using a flashlight to check for leaks to ensure the job was done correctly. Begin by removing the electrical connector from the fuel injector, some connectors have a safety clip that needs to be released as well. Remove the mounting bolts located on each corner of the fuel rail, these locations can vary. This will enable the fuel rail to be loosened and allow the fuel injector to be removed. Inspect the old fuel injector and account for both sealing O rings as they can get stuck in the rail or down inside the intake manifold. An injector O ring seal is used at either end of the injector and should be replaced when installing a new injector. The old fuel injector should match the new unit, remove the dust caps from either end and ensure new O ring seals are installed. Gently push down on the rail while aligning the remaining injectors. Reinstall rail mounting bolts and tighten. Reconnect the electrical connector to the fuel injector. Once the job is complete inspect the fuel rail for leaks after the engine has been started and ran.